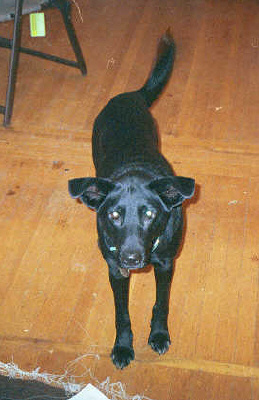 A black mutt born approximately (± 6 months) in March 2001. Adopted from an Animal Rescue League on September 1, 2002. Approximately 23 kilograms, he has a strong herding drive, an impressive vocal range (at least 6 distinct growls), and is very smart. About the name: Corvis is the Latin for Raven (Crows and Ravens are the Corvae family). He is a solid black dog with his most distinct feature being oversized ears (wings). "maybe I'm just jaded from dealing with technology so much, but every now and then I'm amazed that dogs 'just work' 100% of the time"